rince George took on the biggest diplomatic challenge of his young life last night when he was allowed to stay up late to meet the leader of the free world. 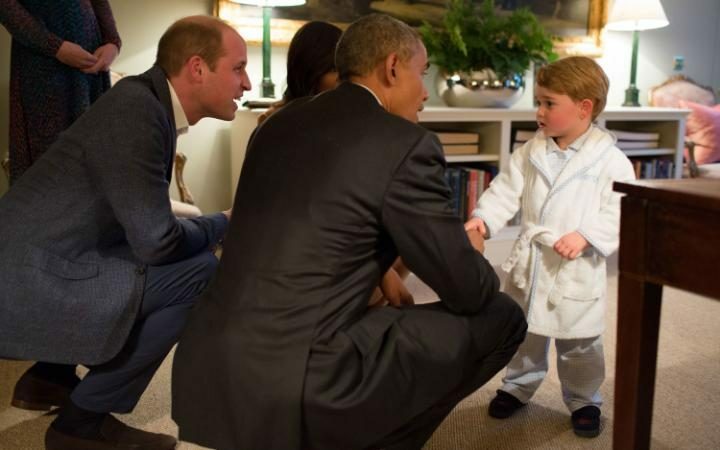 The two-year-old, in his pyjamas and dressing gown, was waiting for President Barack Obama and his wife Michelle when they arrived at Kensington Palace for dinner. And he immediately charmed them by playing on a rocking horse given to him by the Obamas for his first birthday, and with a cuddly toy dog they had sent him as a gift when Princess Charlotte was born. Mrs Obama is reported to have asked if she could meet George and Charlotte during the couple’s current visit, and while Palace staff said they were unaware of such a request, the Obamas’ meeting with the future king was clearly a highlight of their trip. 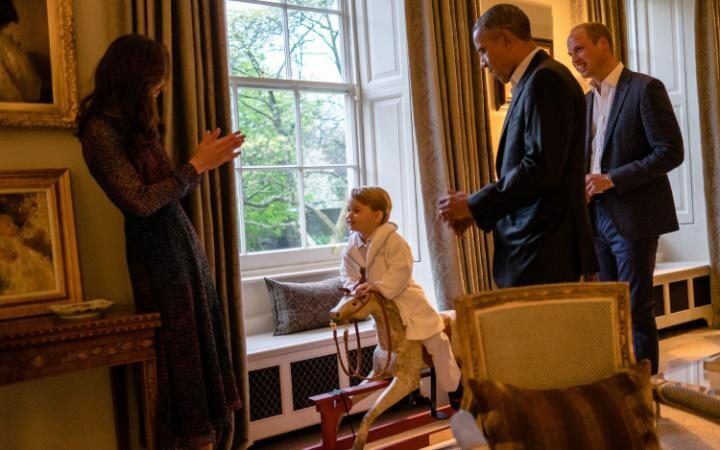 Prince George politely shook hands with the President as he and Mrs Obama fussed over him, then boarded the handmade rocking horse, which has the presidential seal on its saddle, to show the American guests how much he loved it. Unfortunately if was past Princess Charlotte’s bed time, so she was already asleep by the time the Obamas arrived, but George appeared to be doing just fine on his own as his mother, the Duchess of Cambridge, clapped her hands with delight at his perfect performance. Earlier Mr and Mrs Obama had lunched with the Queen at Windsor Castle, after which the President described Her Majesty as “a real jewel to the world”. 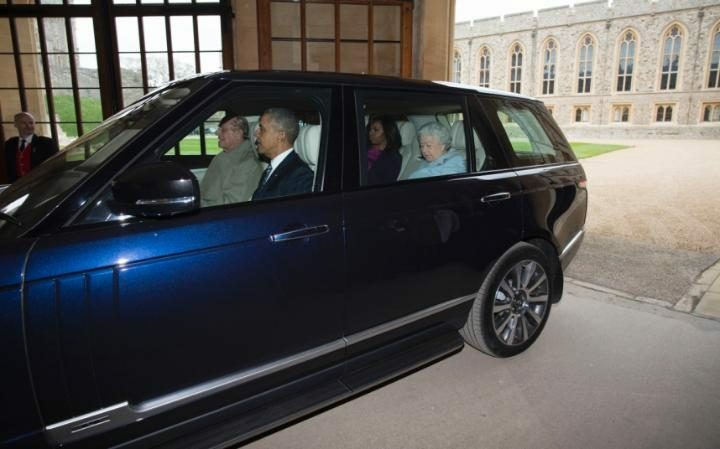 Mr Obama found himself being chauffeured by the 94-year-old Duke of Edinburgh when he arrived for lunch at Windsor Castle. Unaccompanied by any body guards, the Queen, the Duke, the President and the First Lady made the shortest of road trips from Mr Obama’s helicopter to the Castle doorway. 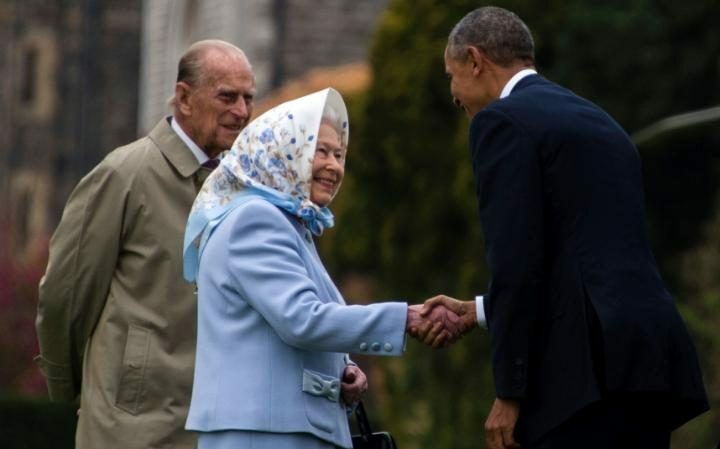 It was, as far as Mr Obama was concerned, a moment that encapsulated the famous but sometimes indefinable “special relationship” between the two countries, because the Queen, he said, is what makes it so special. “She is an astonishing person and a real jewel to the world, not just to the United Kingdom,” the President said later in the day, during a press conference with David Cameron. He added that “the Queen has been a source of inspiration like so many people around the world”. The Obamas have undoubtedly taken the Queen to their hearts ever since their first meeting in 2009, when Michelle Obama and Her Majesty famously put their arms around each other. There was little protocol on display yesterday either, as the President and First Lady shook hands with the Queen and Prince Philip without feeling the need to bow or curtsy. If anything, though, the President appeared to have more admiration for the Queen than ever. As he comes to the end of his maximum two terms in office, a mere eight years, the Queen carries on, ready to welcome the 13th US President of her reign, whoever he or she may be. He made his own rather quirky attempt to define the special relationship, saying: “I have a staff member who will not be named, because it might embarrass her a little bit, who generally on staff trips will not leave the hotel, or the staff room, because she is constantly doing work making this happen. “She has had one request the entire time that I have been President and that is could she accompany me to Windsor, on the off-chance that she might get a peek at Her Majesty, the Queen. “And gracious as she is, Her Majesty actually had this person, along with a couple of others, lined up so that as we emerged from lunch they could say hello. “And this staff person, who as tough as they come, almost fainted. I'm glad she didn't because it would have caused an incident. The Obamas had flown to Windsor from Winfield House in Regent's Park, home of the US ambassador Matthew Barzun. His personal helicopter, Marine One, landed on the golf course of the 16,000 acre estate next to the castle walls, shortly after two other choppers carrying the US media and the presidential entourage and security detail. As the blades of the President's helicopter stopped, the Duke pulled his navy blue Range Rover forward so he and the Queen could welcome their guests. A bodyguard then jumped behind the wheel and turned the car around ready for the Duke to make the return journey. Then, as the American guests were led to the car, the President seemed completely bemused by the seating arrangements. He first tried to get into the back seat, where he is used to sitting, before being told by the Queen's personal protection officers that Her Majesty was going to sit there. Finally, with a huge smile, he got into the front passenger seat, where he found the Duke next to him at the wheel. Once the Queen and Michelle Obama - wearing Oscar de la Renta - had settled into the rear seats so they could chat to each other, the Duke was off, driving the foursome around 400 yards into the castle itself. It was a rare opportunity for both the royal couple and the Obamas to enjoy a private, if brief, drive together without the bodyguards, staff and backup vehicles that normally accompany them. Mr Obama was not the only one who was confused by the episode. Members of the US media were open-mouthed as the President got into the front, saying in disbelief: "Is Obama driving?" They were then reminded that in Britain the driver sits on the right. The Duke looked relaxed at the wheel of the Range Rover as it made its way around the castle's quadrangle and stopped outside the Sovereign's Entrance. After posing for pictures in the Oak Room, where the Queen has recorded some of her recent Christmas broadcasts, the foursome went to the Queen’s private dining room for a very private lunch. At their lunch, the President gave the Queen a 90th birthday gift of a photograph album chronicling her meetings with US Presidents and First Ladies. Her Majesty’s first visit to the United States was in 1951 as Princess Elizabeth, when she toured George Washington’s Mount Vernon Estate and met President Harry S. Truman. Her first visit to the United States as Queen was in 1957, during which she met both President Dwight D. Eisenhower and former President Herbert Hoover. He later said he had returned to the UK to "wish her Majesty, the Queen, a very happy 90th birthday". He added: "Earlier today Michelle and I had the honour to join her Majesty and his Royal Highness, the Duke of Edinburgh, as their guests at Windsor Castle, where we conveyed the good wishes of the American people." 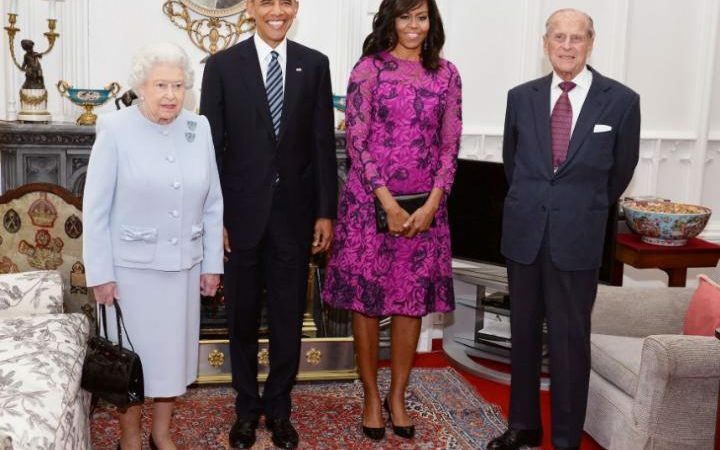 The Queen is well used to hosting American leaders - Mr Obama is the 12th US president of her reign and the Queen has met all of them, except one - Lyndon B Johnson. The lunch lasted around an hour before the Queen and the Duke said goodbye to the outgoing US leader and his wife. The President's car Cadillac One, known as The Beast, was waiting in a line-up of 11 vehicles, ready to transport him to Downing Street. Following his press conference with David Cameron, the President was back on royal duties, as he and Mrs Obama went to Kensington Palace for a private dinner with the Duke and Duchess of Cambridge and Prince Harry. They had all met each other before, but waiting in the hallway of Apartment 1A, the Duke and Duchess’s London home, was one member of the Royal family the Obamas have never met - Prince George. The two-year-old stood waiting, twiddling his fingers in his waistband. “Hello! There you are!” bellowed the President as he and Mrs Obama got out of their car in the courtyard of the Palace, seeing the three hosts standing in the rain. Mr Obama tried to give his umbrella to the Duchess, who was wearing LK Bennett, but she politely declined. “We’ve thoroughly enjoyed it,” said the President. Off camera, the President and First Lady met Prince George, who had “stayed up for a few minutes” to meet them, according to a Palace source, though Princess Charlotte, aged 11 months, was already in bed. Inside, there was one more photo call to get through before dinner, pictures in the Duke and Duchess’s living room, where Prince Harry sat on one side chatting to the Duchess and Mrs Obama, while the Duke sat on the opposite side of the room with Mr Obama. In one corner stood a grand piano, covered in family photographs and with a vase of flowers on its lid. Carefully-placed in the foreground was a cuddly toy dog, a gift sent to London by the Obamas for Prince George, another symbol of the special relationship. A Palace source said the Obamas had chosen the cuddly toy because it looks like their own dog, Bo, a Portuguese Water Dog. With Prince George having his chance to thank them for his gift in person, the relationship may be just that little bit more special after last night.